Yet another great toy from the same folks who give you the popular Shredders. 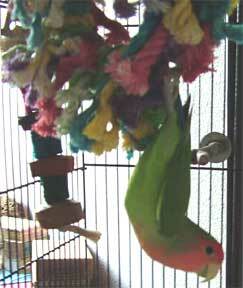 These colorful "corn cobs" are strung on natural fibers which your FIDs will love to shred! One of our most affordable, natural toys! NEW SIZE, the Mini (pictured above left), great for all those 'lil tweets in your house!! Check out Oliver, the peach face lovebird ... he might be hanging out on his cotton wreath but he also spends time chewing on his kokocorn kruncher, pictured in the background. If your bird loves this toy, check out Planet Pleasures Butterfly!